"All Mongolian Tours" tour operator is located in #1619, Peace Tower, Peace Avenue 54, Ulaanbaatar city, Mongolia. 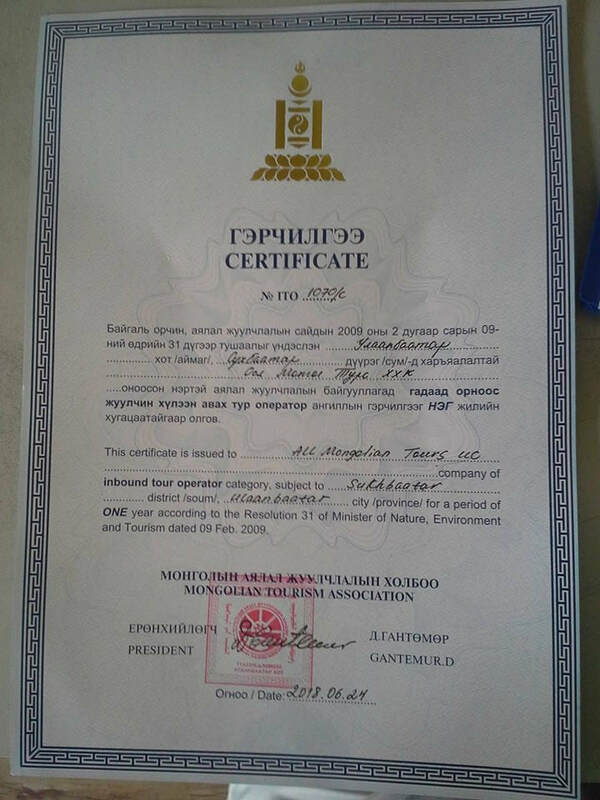 All Mongolian Tours LLC is inbound tour operator holding ITO 1070/S certificate issued by Ministry of Mongolian Tourism and Mongolian Tourism Association. Main purpose of "All Mongolian Tours" is to introduce Mongolian nomadic culture and natural beauty and develop its tourism. All Mongolian tours offers Mongolian top 30 tours for foreign tourists who are planning to travel to Mongolia. We provide tour plans, itineraries, minivan, guide, hotel & ger camps, 3 meals a day, drink, outdoor gears. Also we advice how to get visa to travel to Mongolia. We have contracted cooperation with local tourist camps, hotels in UB, horse guides, restaurant etc. We offer cheapest prices depending on the number of people and lodging. 10 reasons to choose "All Mongolian Tours"
Responsive to your emails within 24 hours. Car rental service with experienced certified driver and high quality car with tent, sleeping bags etc. We organize and plan customized tours depending on your duration and interests. You can request traditional cuisine, nomad family stay, horse ride or other special activity for your tour. Offers cheapest prices for the top 40 tours of Mongolia. Easy and fast to reserve. 100% local tour experts. Find your travel buddies contacting our team. Join a tour. We have contracted cooperation with 5 star hotels, tourist ger camps, ger guesthouses, horse guides. 10% of our company profit is donated for wellness of orphan children in Mongolia.